Alexa's powerful automation tool creates lots of new possibilities. Here's how to put it to use. One of the most powerful features of Amazon’s Echo smart speakers is called Routines. Instead of just letting you do one thing at a time, Routines can tie multiple actions to a single voice command. They can even automate tasks without needing you to speak at all. To begin creating Routines, open the Alexa app for Android or iOS, tap the menu button in the top-left corner, and select Routines. To add a new Routine, hit the + button in the top-right corner. Arrive or leave: Uses your phone’s geo-location to trigger a routine at home, work, or a specific address. Alexa says will make your Echo say something out loud. This can either be a custom phrase or one of several preset utterances, such as a joke or a salutation. Calendar will have Alexa read the current day’s agenda, tomorrow’s schedule, or just the next event. Device settings can adjust Alexa’s volume, stop audio playback, or toggle Do Not Disturb mode. Messaging can either send a custom notification to the Alexa app, or broadcast a custom message to Echo and Fire TV devices. Music will play a song, artist, or playlist from your choice of Amazon Music, Spotify, iHeartRadio, Pandora, or TuneIn. (If you don’t see all these options, sign in first through Settings > Music in the Alexa app.) You can also set a timer to make the music stop automatically after a while. 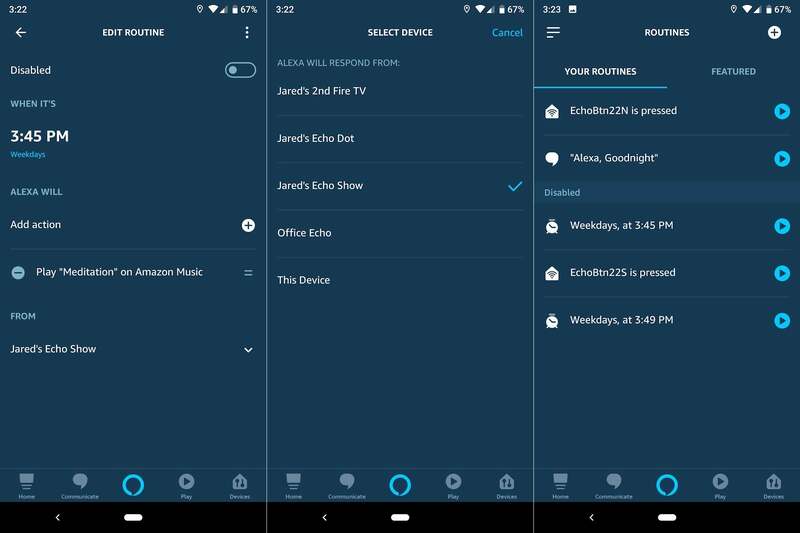 News will have Alexa read your Flash briefing, which itself can be customized through Settings > Flash Briefing in the Alexa app. Traffic will have Alexa read a traffic report, assuming you’ve set up commute details through Settings > Traffic in the Alexa app. Wait will make Alexa pause for a given amount of time between actions. Weather will make Alexa announce the local forecast. Once you’ve set up an action, you’ll head to an Edit Routine menu, where you can further customize the Routine. To make more things happen, hit the + button next to “Add action,” and then select another action from the menu. You can then press and drag the = button next to any action to rearrange its order, or tap on the action itself to modify it. For certain trigger types, you can also specify which Alexa device will provide the audio output under the “From” section. 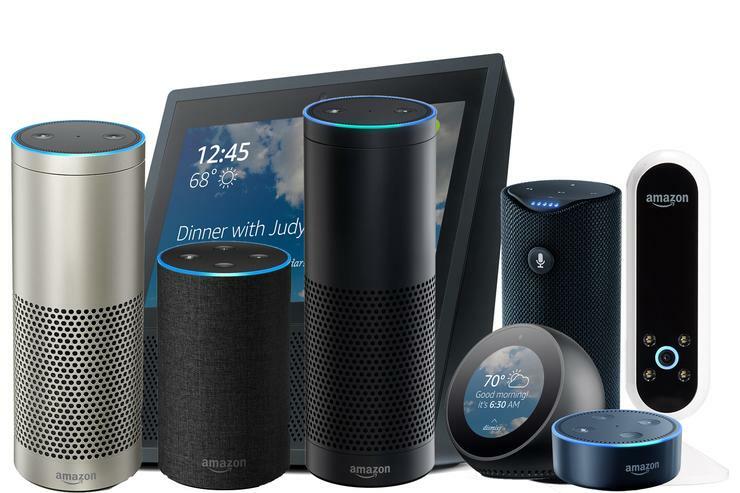 Either choose a specific device, or select “the device you speak to,” which even works with the Alexa app on your phone. Finally, take note of the “Enabled” toggle at the top of the screen. Switching this off will disable the routine, so you can temporarily stop it from running without deleting the whole thing. One of the best ways to start using Alexa Routines is with wake-up and bedtime actions. For bedtime, try creating a “Goodnight” routine that plays relaxing sounds for a certain amount of time. If you have any smart light bulbs in the bedroom, you can have those turn off as part of the Routine as well. For weekday mornings, try creating a scheduled routine that turns on your smart light bulbs, announces the forecast, your agenda, and your commute, and then begins playing music. You might even create two separate morning routines, with the first one turning the lights on dimly and playing meditative music to wake you slowly, and the second one cranking the lights to full blast with some more upbeat tunes. If you have an Echo Button, you can even give yourself a snooze button to slap. Just set the Echo Button as the trigger, and then create three actions: Stop playback, wait 10 minutes (or however long you prefer to snooze), and then start playing music again. You can also prevent yourself from hitting snooze a second time by selecting “Change” next to “Anytime” in the Edit Routines menu, and then setting “Suppress For” to an hour or so. Echo Buttons can also be used to create all kinds of fun Routines. Try using one to give yourself a random affirmation, start playing some funky music, turn on all the house lights, or broadcast a “Dinner’s ready!” message to every speaker around the house. Users of multiple voice assistants can even make an Echo Button work with other companies’ smart speakers by having Alexa utter a “Hey Google” or “Hey Siri” wake word. Alexa’s location triggers can enable some powerful automations as well. Try having them turn off any music and lighting when you leave, or start playing some relaxing music when you get home. Although Alexa’s Routines are easy to set up and use, they do have some notable limitations, especially compared to Google Assistant Routines on a Google Home speaker. Most notably, there’s no way to have Alexa carry out custom voice commands. You’re instead limited to whatever’s available through the “Actions” menu, which means you can’t use routines to automate video playback on Fire TV devices, interact with third-party skills, or play your personal music collection from a media server such as Plex. Alexa Routines also don’t support multi-room audio, so any Routines involving music are confined to a single speaker. Some of Alexa’s Routine shortcomings do have workarounds, though. 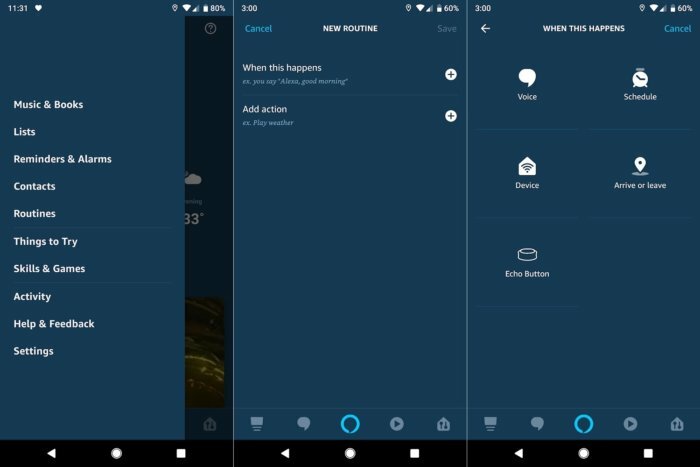 With lighting control, Alexa Routines are incapable of dimming multiple lights as part of a Group. You can get around this by adding each light to your Routine individually, and setting their brightness levels one-by-one. Another notable limitation: Music playback can only be the final step of a Routine, so you can’t create a morning alarm that plays a few minutes of relaxing music before switching gears. The only way around for this is to create separate Routines and schedule one after the other. And while Alexa’s new location-based triggers can come in handy, they only work with a single user. That means you can’t ensure everyone’s out of the house before triggering a Routine that turns off the lights and lowers the thermostat. You’ll need to look beyond Alexa Routines for this. Certain smart home hubs, such as Samsung’s SmartThings, support multi-user geofencing, and you can also use the location-sharing service Life360 with IFTTT to automate smart home devices based on multiple users’ whereabouts. Despite these limitations, Alexa Routines continue to get more useful on a regular basis, with music timers, wait times, and location-based Routines among the most recently added features. Hopefully it won’t be long before Amazon takes the training wheels off and lets users do even more.